North Korean leader says his country needs to ensure its economy is more self-reliant. North Korean leader Kim Jong Un on Wednesday night said his country needs to deliver a “serious blow” to those imposing sanctions by ensuring its economy is more self-reliant, Reuters reported, citing the official Korean Central News Agency (KCNA). The comments mark the first time that Kim has stated North Korea’s position on the second US-North Korea summit in Hanoi that collapsed in February. US President Donald Trump abruptly ended his February summit with Kim in the capital of Vietnam, explaining that, while “we had a productive time,” no deal was signed. He explained at the time that Kim had asked for total removal of sanctions before denuclearization, something to which the US could not agree. US-North Korean engagement has appeared to be in limbo since that summit. A senior official in Washington said last month that the US still believes the “fully verified denuclearization” of North Korea is possible by the end of Trump’s first term. 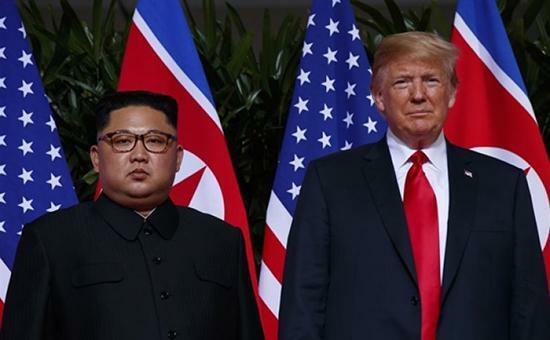 Despite the breakdown of the summit, North Korean media later indicated that Kim and Trump had decided to continue productive talks to resolve problems discussed at their Hanoi summit. State media have published images and reports of Kim’s visits to at least four economic projects in five days over the past week, including a remodeled department store, tourist resorts, and an economic hub near the border with China, according to Reuters. Despite no direct mention of the United States, by linking sanctions with “hostile forces” that impose them Kim is showing a slightly stronger stance toward Washington than was recently in state media, analysts said Wednesday.